Okay, this isn’t really the first ID challenge I’ve had on this site, but the first in a series that is formally named such. I’ll be offering these up occasionally to fill the void left by the suspension of Alex’s Monday Night Mystery series (okay, not really a void – we still have a wealth of serial quizzes to choose from, including Crypsis Challenges by Troy, Monday Mimic by Mike, Name the Bug by Chris, Genius of the Press by the other Chris, Electron Challenge by macromite, and my own Super Crop Challenge!). This series will feature classic identification challenges, with points awarded for correctly naming the order, family, genus, and species. Points are not mutually exclusive – you don’t have to be first, you just have to be correct. That being the case, I’ll turn on comment moderation during the answer phase so that all have equal opportunity to participate. I also give bonus points for providing additional diagnostic information, comments on taxonomic status, or even wrong answers if they somehow make me chuckle. I’ll give this a day or so – starting… right… now. Update 12/24/10: answer posted here. This entry was posted in [No taxon] and tagged entomology, ID challenge, insects, Nebraska, quiz, science. Bookmark the permalink. Coleoptera, Carabidae, Cicindelinae… I’ll see if I can get the rest once I look through your back catalogue. Yes, yes, yes… 4 pts. Cicindela scutellaris scutellaris. You posted a photo of it just recently with the same metallic green thorax and cream labrum. Right genus (2 pts), but not scutellaris, which has red/purple elytra. However, a bonus point for properly italicizing the binomen makes you the first leader with 7 pts. Coleoptera; Cicindelidae (or Carabidae: Cicindelinae if you prefer), Cicindela ancocisconensis, ‘the Appalachian tiger beetle’? Going by the green colour, pale bristles, and creamy labrum & basal third of the mandibles. Everything right down to genus, but not ancocisconensis, which is brown and does not occur in Nebraska (given in the tags). 6 pts. Arthropoda Hexapoda Insecta Coleoptera Carabidae Cicindela sexguttata — ’cause it’s even greener than Kermit. I like this – three guesses, all correct down to genus, but not the species. Cicindela sexguttata is a good guess based on coloration (it usually tends to be a little more bluish than this), but the front of the head of that species is glabrous. 6 pts. But the head/labrum of C. sexguttata is smooth; those are very prominent setate. I am stumped for now, but will chew on it a while. Alright, I’m going to say C. scutellaris . I would venture a guess of either subspecies rugifrons or leicontei (most likely the latter since I know it occurs in Missouri), but I’m hard pressed to explain the difference between the two subspecies other than geographically. Although there are some subspecies of scutellaris that have uniform green coloration, they do not occur in Nebraska (note the tags :)). Also, scutellaris is a little stockier and shorter-legged than this species (admittedly, these characters aren’t really visible in the photo). I will give you a bonus point for proper italicization of the binomen, so you now lead with 8 pts. Hmm… Well, it’s Coleoptera: Carabidae: Cicindelinae, or Carabidae: Carabinae: Cicindelitae, depending on who you ask… don’t know beyond that, but the green color would narrow it down if I knew my tiger beetles… Seems like the white markings at the anterior end of the elytra and the very hairy legs & face would rule out Cicindela sexguttata, the only green species I ever run into. Yes down to family, and a bonus point for alluding to the subfamilial/supertribal rank debate. You didn’t commit for sure to a genus, but since you correctly explain why this is not Cicindela sexguttata I’ll give you a bonus point for that and half credit for the genus. 7 pts. Yes down to genus (the family is actually Carabidae, but since there are still some influential holdouts for family status I’ll look the other way). Cicindela campestris is a similar species occurring in Europe. 7 pts (bonus point for proper italicization). 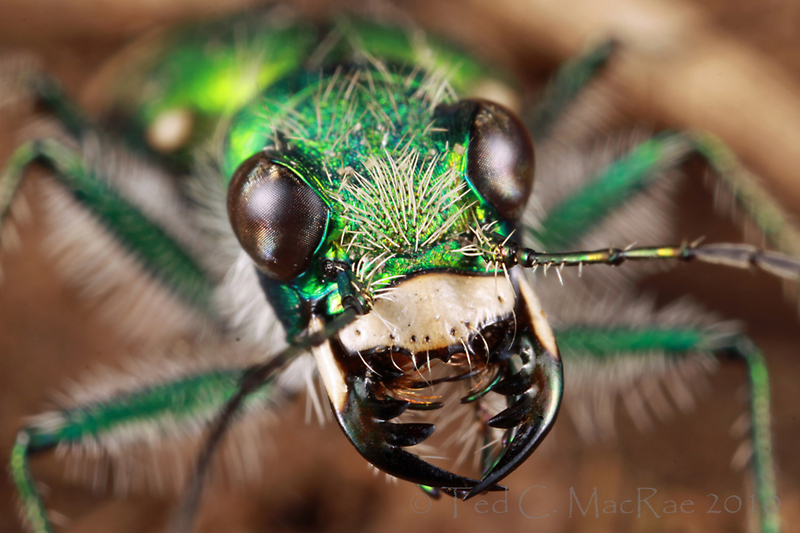 I’m going with six spotted tiger beetle (Cicindela sexguttata), genus Cicindela, family Carabidae, order Coleoptera. It’s the fluorescent green body, big beady black eyes and white mouth that make me think that. Those are usually pretty good gives for this species as far as I know. A fluorescent green tiger beetle would really be something! 2 pts each for order, family, and genus, and a bonus point for proper italicization of the binomen (note, however, that order and family are not normally italicized). Cicindela sexguttata is a superficially similar species but easily distinguished by the glabrous front of the head (it’s also usually more bluish-tinted). 7 pts. Cicindela decemnotata, from the size and shape of the mandibles, the amount of setae, the visability of a portion of the humeral lunule, and the three dark teeth on the labrum. OK, what? A very good guess! However, while C. decemnotata has been recorded from Nebraska (note the tags), it is known from that state by very few specimens. That species also is generally not as bright-green as this one, often showing some degree of red tinting and with a shinier (almost oily) appearance. 6 pts. Bingo – a correct species ID (and bonus point for proper italicization) puts you in the lead with 9 pts. well, … guess I’ll take a shot …. Cicindela kaibabensis Johnson, that inhabits grassy meadows north of the Grand Canyon, AZ? Ted, BTW, is C. kaibabensis still considered a subspecies of terricola? Yes – still a subspecies of terricola, and also now called Cylindera terricola kaibabensis as a result of the elevation of the former subgenus to generic rank. Another good guess based on color, but it does not occur in Nebraska (note the tags) and has the maculations usually connected. 7 pts. (including bonus point for proper italicization).